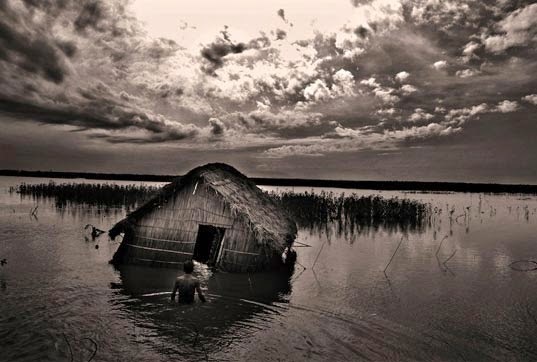 this aspect of climate and continue to exist in waist-deep flood waters, sometimes even inside their homes." Take take take, more more more. The consumerist world that has been created for us by the rich and powerful is like a bubble, with little connection to the Earth that gives us life. We’ve become conditioned to accept that meat comes in packets, expect that clothing should be super-cheap and have unlimited stock, and that fuel just comes out of a convenient metal tank at a service station. How can we have harmony with the environment and have a moment to question where these products come from, when everything is moving so fast that we want them NOW? Reconsidering our habits, lifestyle and consumer choices are changes we can effect within us, and it’s never too late to do so. With so many resources at our fingertips on the internet - whether it be switching to green power, conscious eating, or recycling - it’s easier than ever to be green. Even the smallest actions count, all amounting to one great, powerful effect. It all starts with a thought. Changing our own lives is important. But the biggest changes must come from above. Calling to account our governmental leaders to reflect their people’s concern for the environment presents a problem that apparently isn’t as straightforward as taxing big polluters and investing in renewable energy sources. Agendas are riddled by back-room handshakes from greedy magnates and vested interests. It’s maddening to watch their thumb-twiddling, head-scratching and back-and-forthing as the news tells us that people are already suffering, their lives at risk, as a direct result of climate change. The increasing occurrence of natural disasters has been linked to it. Human greed has contributed vastly to the problem. Take take take, more more more. We all know the Earth is dying, now at an urgent rate. It's up to the individual whether that is accepted (or worse, dismissed) as inevitability beyond repair, or whether deep concern for future generations translates to hope for change. One thing is certainly unanimously acknowledged: saving our planet is no longer an alternative mandate. The science has spoken, people are galvanising, and world leaders should be taking notice. I was proud to be one of approximately 30, 000 citizens marching in Melbourne today as part of the worldwide People’s Climate March, preceding the UN Climate Summit of world leaders in New York this week. We want our leaders to know that we want immediate and real action on climate change, with an economy that works for all global citizens and of course the planet we live on. It was a glorious sunny day, with a humbling vibe of goodwill. I don’t think I’ve ever high-fived and smiled at so many strangers before. Kids, uni students, adults of many ages, the elderly, people on wheelchairs, a rainbow of cultures: a broad representation of impassioned Australians. If any commercial news channels only choose to give airtime to the most stereotypical-looking of 'hippies' at the event, please consider that this is likely due to a subconscious prejudice and blatant information control; provision of fuel for those most opposed to the issue at hand, who will readily bah-humbug this as an uprising of smelly stupid hippies misguided by lefty idealism. Questioning the reliability and twisted intentions of our news sources is not only another important step in progressing the issue at hand, but also in opening up our acceptance of others. I am also proud to represent The Future, a new climate justice group that originated in the UK and has just commenced operations in Australia. Ollie Henderson from The Future has a clothing label called House of Riot, and she generously gave me one of her cool and succinctly-sloganed t-shirt designs for me to wear today. It was a tough call with so many great slogans, but I chose “SAVE THE HUMANS” in the end. It got a fair bit of attention, but my favourite was from a delightful elderly man who stopped me and said “I just love the message of your t-shirt. To me it is the most important reason that I am here today. I'm not sure that the politicians realise that is what it's about, too - their people.” We also painted circles around our eyes – the defining visual campaign for The Future, which is a statement to our leaders: “we are watching you”. And I will be. Very closely. My viewpoint has always been: 'get out as soon as you can/ and don't have any kids yourself.' But I guess if there are people like you on this earth then it may well be worth saving. Of course, people are terribly stupid and it will be very hard to get this sorted. I doubt a clear solution can be reached even if the politicians and corporations buy into our message; if they started today, for instance, and said yes let's tackle this problem head on...where would that leave us? What do you do? How do you even begin at solving this problem? Thank you for your comment, and sorry about the delay in my response. I agree, it's overwhelming especially considering the enormity of the issue, its devastating effect so far and how much further we have to go before we can see real change. It seems it will take years yet for skeptics or conservatives to admit their ignorance was the biggest obstacle in progressing action on climate change; hopefully they will be enlightened with the wisdom of hindsight. But for now...we do our bit in our day to day lives. It all matters. And we persist in calling to account our world leaders, nagging at our local government representatives, making our voices heard - we want a future. Don't they? It's in all of our hands. You begin at any beginning. The lack of a clear solution should not entitle us to rest on our haunches. We are doomed if we remain idle but there is still hope if we try for a solution. The first step is awareness and Juliet has been instrumental in this. I thank you for your assistance. The other day I was speaking to my brother about this issue; I generally see him as an intelligent person, and the argument he put toward me was an original and intelligent one, if rather nontechnical, given the science surrounding this topic; but it was one that touched at the nature of the topic by reflecting on the people behind the science. He said to me that at the time of the climate change movement, early on in the 2000s, the top climate scientists would have been those scientists with at least 20-30 years of experience in the field. These scientists had no direct impetus, such as our current predicament, to spur them on to matriculate into their field (climate science); following from this, it may be said that these top scientists, although the best in their field, were by no means the top students of their class, because a person who entered into this field traditionally had a middling high school ranking. My brother then told me that he had no faith in these individuals to adequately interpret something so complex as the climate. In varying degrees I agree with him, but although I don't think they are geniuses, nor do I think they are stupid. How interesting - I've never heard this viewpoint before. Of course there has been so much contention over the facts, and some massive faux pas (the East Anglia email leak from a few years back with the bunged figures, for example), but I believe that in the past decade the field of climate science now attracts some of the brightest minds in science at large. And the latest research from IPCC and climate scientists is far more evolved, scrupulous and definitive, and therefore more broadly accepted - even conservative leaders the world over are shifting their views. This is good news. Thank you for your support. March on!